What is High Speed Machining? There are many definitions for High Speed Machining (HSM). MMSOnline uses the tagline “Achieving high metal removal rates with quick milling passes” for the HSM zone on their site. Another very high tech definition of HSM is “Machining at the Resonant Frequency of the Machine,” which goes to HSM techniques for selecting spindle speeds that minimize chatter. You’d think that the “High Speed” part of HSM would emphasize faster spindle speeds (Sandvik says HSM begins at 18000 rpm), but that interpretation is not universal as various shops discovered HSM techniques can work well even on slower spindles. Others argue that HSM is all about high material removal rates and leaving a surface finish good enough to call finished in one pass. The dotted lines represent temperatures at various surface speeds. Note that all of the materials go steadily up and then eventually start dipping back down again as surface speed increases. Somehow, high speed machining causes temperatures decrease beyond a certain spindle rpm! This chart is in meters/minute, so multiply the values by about 3 to get to SFM. For aluminum, we have a pretty good dip by the time we’re hitting 1000 SFM, for example. In fact, it’s temperature is more equivalent to less than 300 SFM on the other side of the aluminum curve–that’s nothing for aluminum. Heck, if we have a fast enough spindle, there’s even room to run HSS faster and get lower temperatures (you’ll note various cutter materials critical temperatures are also marked off–stay below the line for your cutter!). Steel and cast iron taper down more gently than aluminum, but the effect is still alive and well. Yes Virginia, there surely is some strange behavior when you start in with that HSM stuff! 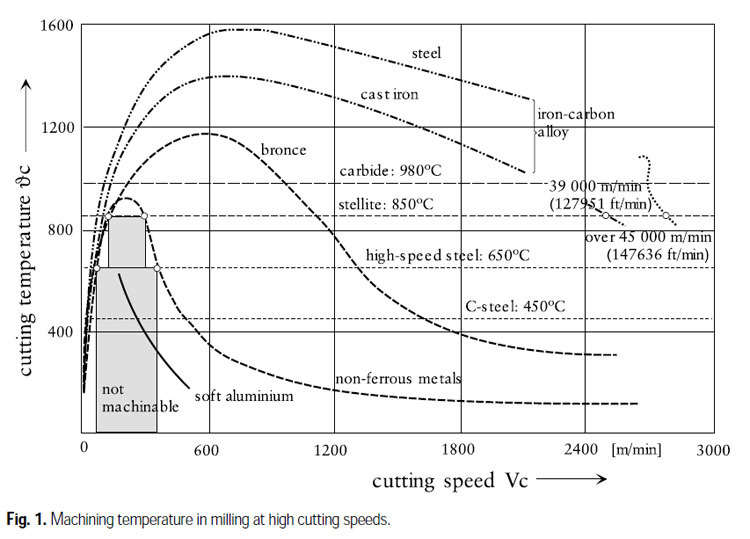 The same research showed that cutting forces also come down, and that’s at least one reason why the temperatures drop, and why for HSM machining in the right rpm ranges, you can achive high MRR’s with lower cutting forces. While we’re on the subject of temperature, sometimes a little heat is important. 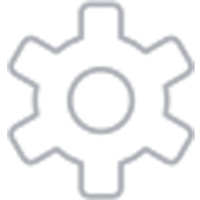 Certain coatings, such as TiAlN, require a minimum “activation” temperature. At that temperature, their chemical composition changes, the coating is “activated” and it is only then that the coating is doing its job of protecting the cutter. 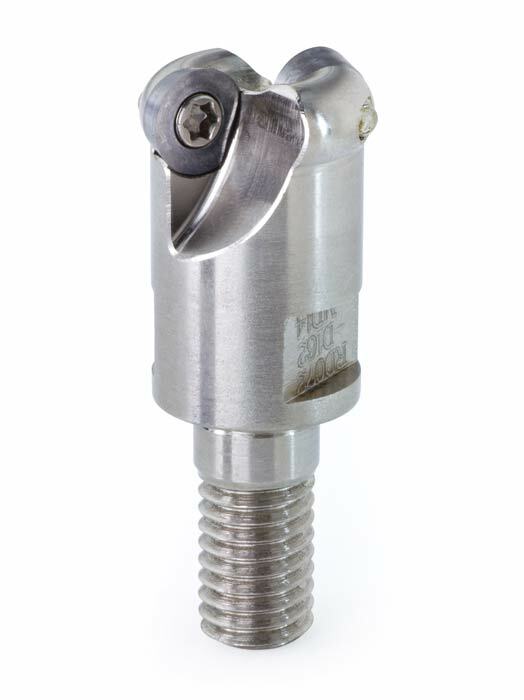 The combination of a desire to activate the coating and the desire to avoid shock cooling delicate carbide (which causes it to crack and splinter) is why we may see a recommendation from the tooling manufacturer to turn of the coolant even when running at very high spindle speeds common for High Speed Machining. Forget the Definitions and Take Advantage of HSM Techniques! Whatever your pet definition of HSM may be, I like to look at HSM as a collection of techniques that “grew up” together in various aerospace machining operations such as Boeing’s. It initially involved very high speed spindles but many of these techniques have since turned out to be applicable even for lower speed spindles. – HSM prefers to combine roughing and finishing passes. This is really only possible with higher speed spindles, because lower speeds just don’t produce the surface finish. 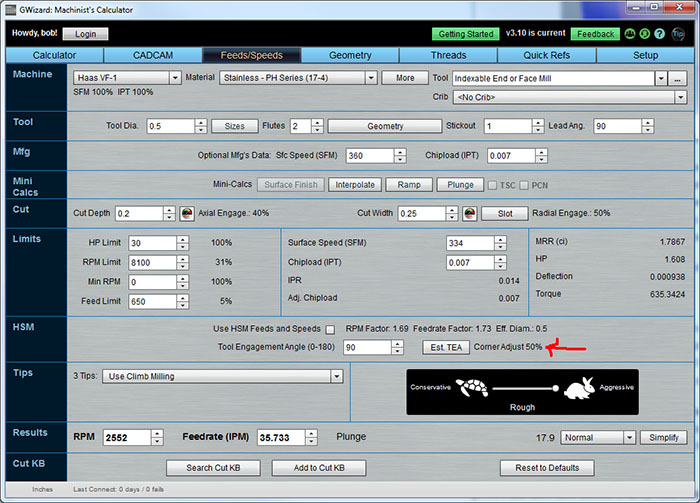 The potential to skip the finish pass will also vary with the CAM package. Some HSM algorithms are smoother than others. If you’re trying to get by with a slower spindle, you’ll have to split into the more traditional roughing and finishing passes. For the finishing pass, use tooling with as many flutes as possible. Finishing assumes all the inside corners have been roughed out, so there will be plenty of chip clearance available. The more flutes you have, the faster you can feed through the work for a given chip load. Hence, productivity goes up. The only reason to use fewer flutes is to improve chip clearance. – HSM prefers smaller tooling that moves faster to very large slow moving tooling designed for “hogging”. The smaller tooling saves on tool changes and makes it easier to achieve the ideal of eliminating the need for separate roughing and finishing passes. – To maximize tool life, take advantage of relatively low cut width 10-15% of tool diameter down to as little as 5% depending on where the sweet spot is for your spindle’s max rpm and the SFM your tool can handle in the material. These low radial depths allow the tool better chip clearance and time to cool down in air, allowing for much higher productivity especially on harder materials. See the article on taking heat out of the cut for some idea of how this works. With low cut width, increase the cut depth. This allows more of the cutter’s flute to come into play instead of just wearing out the bottom of the endmill. – Higher MRR’s (and shorter cycle times) typically require a little more Cut Width. Think of Tool Life more in terms of how many cubic inches of material can be removed with the tool rather than how many minutes it can run and you will quickly see that These wider Cut Widths make better economic sense. Some testing is in order to find your balance. 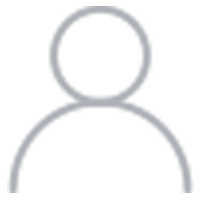 – When spindle speed is a limiting factor, consider a high feed endmill. High feed endmills maximize axial chip thinning and allow much higher feedrates. Another popular roughing strategy when you don’t have as much spindle speed as you’d like are as much machine rigidity is plunge roughing. 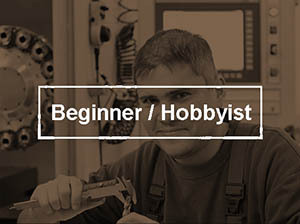 – Use CAM toolpath strategies that avoid the “Tyranny of the Corner” (see below for more on cutters). Such strategies include constant tool engagement angle strategies such as Volumill or Adaptive Clearing, Trochoidal Milling, and Slicing or Peeling of Corners. – Since true HSM spindles offer a much broader range of rpms than conventional spindles, HSM often emphasizes choosing spindle speeds that maximize stable milling zones were chatter is much less likely. 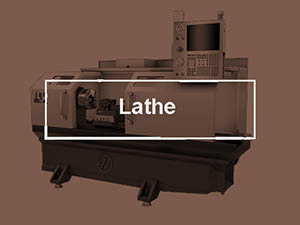 The same anti-chatter principles can be applied to lower spindle speeds, you simply have less rpm territory in which to find a stable zone that maximizes productivity. See our article on chatter for more on stable milling zones and the role of spindle rpm in chatter. So there you have a small arsenal of strategies to choose from for increasing your productivity using ideas learned in the HSM world. Let’s drill down a bit more on some of them. Note how shallow width of cut creates much thinner chips than a full deep cut. Any time your width of cut is less than half the cutter’s diameter you need to start taking chip thinning into account. Failure to do so means you’re not operating at the chip loads the manufacturer recommends. In the best case, you’re leaving money on the table by not cutting as fast as you can. In the worst case, these too-thin chips lead to rubbing and burnishing, which heats the tool and wears it out dramatically more quickly. 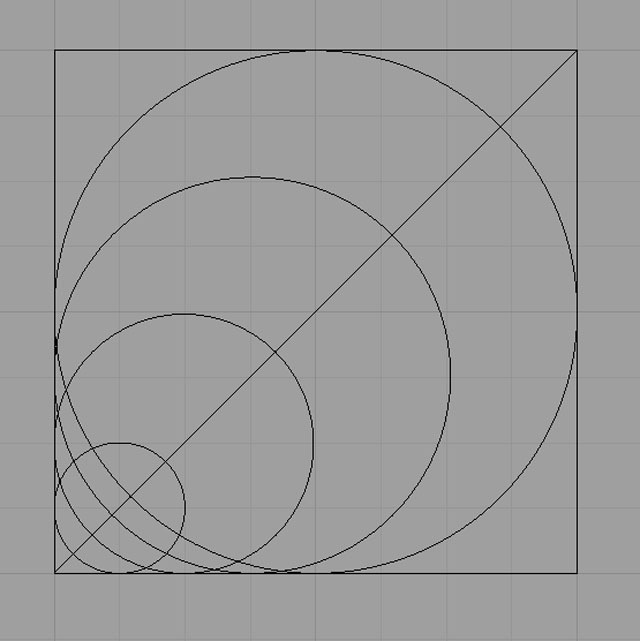 By the way, this kind of chip thinning geometry comes up over and over. You can think of the diagram above as looking down the axis of the endmill. Or, you could view it as the tip of a ballnosed cutter (yes, we get chip thinning in a different way there!). You can also think about it as an insert shape, which helps explain why round insert cutters can be so effective. The standard machinist’s calculations for feeds and speeds don’t account for chip thinning and all of these other geometric effects. Just thinking about how they stack up is enough to make your head spin: does a ballnose in a shallow width of cut experience chip thinning in 2 different dimensions?!?? You’ll need a more powerful machinist’s calculator like G-Wizard to come up with proper feeds and speeds where chip thinning is a factor. The arrow shows direction of cut as it proceeds from right to left into the corner. The diagram shows about 50% radial engagement. 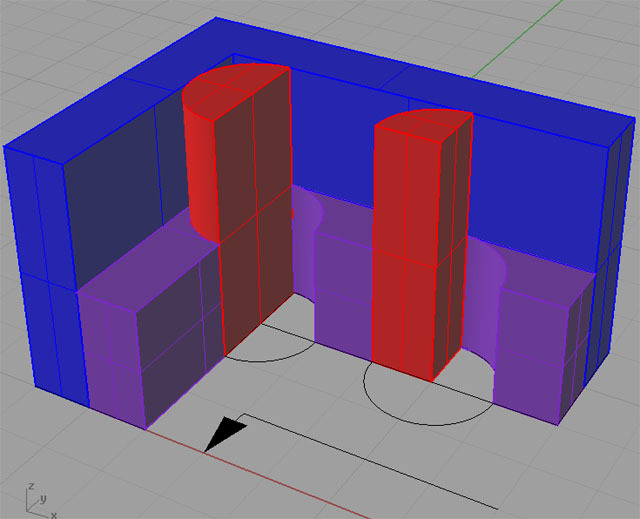 As you can see, moving into the corner doubles the tool engagement angle from about 90 degrees to 180 degrees. When that happens, cutter forces are doubled, the ability to clear chips is halved, and the amount of time a flute spends in air where it can release heat is also halved. This is a very hard thing for a cutter indeed, and the shock of it comes on very suddenly as the cutter doesn’t have to move far to become fully embedded in the corner. In this case we’re showing a 1/2″ endmill making a cut with 10% radial engagement in a pocket with 90 degree corners. We can see that once the cutter hits the corner, the tool engagement angle, which is the number of degrees of the cutter’s circumference engaged in cutting hits a peak of 126 degrees. For comparison, slotting is a 180 degree engagement angle and is about as bad as you can get (well, plunging is 360 degrees!). For a long time the CNC world just dealt with the Tyranny of Corners. Some work was done on feedrate variation to slow the cutter as it went into the corner, but it is very hard to do this well. The corner engagement comes on so fast that the slow down has to extend long before the corner. This interferes with the ability to pick up much productivity by making the cutter run faster in straight lines. What if we could come up with a toolpath strategy that made sure the cutter never had to enter a corner in this way? That toolpath strategy maintains a constant engagement angle for the cutter, which is the essence of High Speed Machining toolpaths. 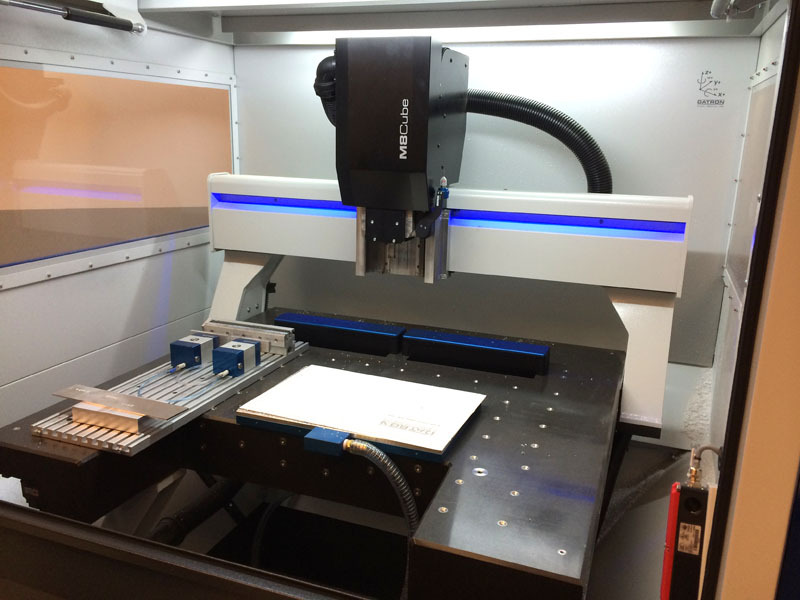 Welcome to the new, higher productivity High Speed Machining world! 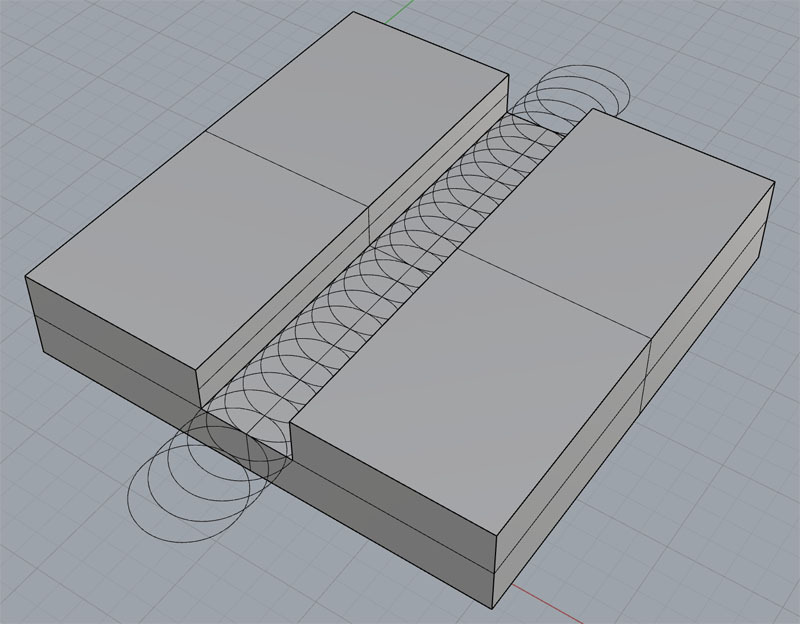 You probably won’t use this feature if your CAM package can do HSM toolpaths, but if it can’t, or if you are trying to tune up an old G-Code program without going back through CAM, knowing how much to adjust can be invaluable. If you’re getting no chatter in the corners–no little chirps or vibrations–your program is running with feeds and speeds suitable for corners, but it could be going up to 50% faster elsewhere. The actual amount of the increase will be less due to acceleration limits of your machine, but try increasing feeds and speeds away from the corners and slowing back down to what they had been as you approach the corner. You’ll be surprised at how much this can speed up an existing program done without HSM tool paths. 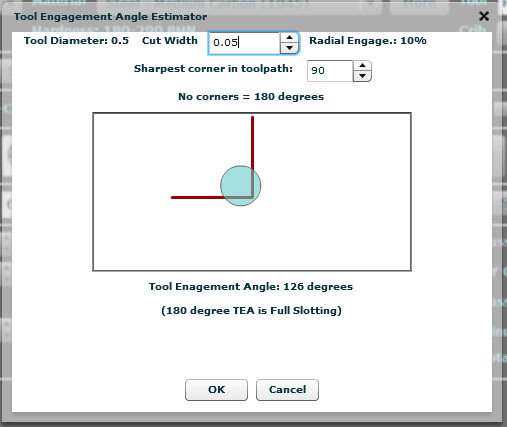 Referring back to our example from the screen shot above, 90 degree corners means TEA’s (Tool Engagement Angles) of up to 126 degrees. Even though we have such a shallow cut (10% of diameter), that’s a lot of engagement. But if we’re cutting in a straight line with no corners, that TEA drops all the way down to just 36 degrees. Wow, imagine how much faster we can drive the cutter if we knew the engagement angle would never exceed 36 degrees? If were just a matter of the ratio of the TEA’s (it’s not! ), we could go 3.5 times faster in the toolpath. Assume that as the cutter is moving into a corner, it veers off along a series of arcs rather than ploughing deep into the corner. Each arc “Peels” another layer, and the depth of cut in the arcs is orchestrated to correspond to reduced cutter forces so we can go full speed through the peel. Can you see how Corner Peeling might get you through that corner faster than just ploughing in with the cutter? 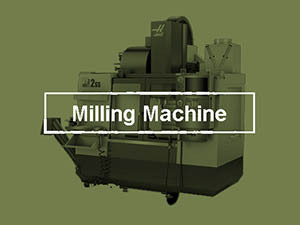 Trochoidal Milling is similar in concept. Let’s take the example of a slot, which is very demanding to cut and forces us to slow down. Suppose we have a cutter that is 1/2 the width of the slot in diameter. Now we have some room to work with. Let’s treat it just like the corner peeling and perform a series of looping moves that slice off little peels of the slot rather than just digging straight in with a big cutter. That’s Trochoidal Milling, which is a type of High Speed Machining. 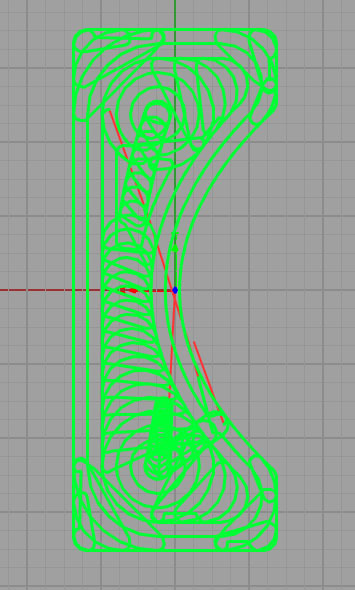 There are some variations, such as whether we use full circular loops or keep the retract side shorter by making little D’s. The choice of the latter depends on your machine’s acceleration capabilities. The D’s demand a faster tighter machine while the loops can be a little more forgiving of slower machines. The thing is, these sorts of cuts are capable of driving the tool enough faster that they can beat a big hogging cutter at material removal, especially if you don’t have a big heavy machine with a lot of horsepower to back up the big hogging cutter. What’s the next level of refinement for this idea? Trochoidal Milling and Corner Peeling are special cases. The Trochoids got created to deal with slot-like narrow pockets and of course Corner Peeling is for corners. 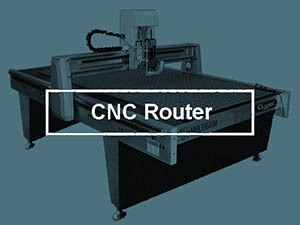 Initially the CAM world wanted to solve HSM by taking the toolpaths they started with and using such techniques to chip away at their weak points. But before too long, folks started thinking of toolpaths that just never create a corner because they relied on completely new strategies. These are the Constant Tool Engagement Angle Toolpaths which go by many brand names such as Volumill, Dynamic Milling, or Adaptive Clearing. They all create elaborate looping toolpaths where the cutter veers away from over engagement just in the nick of time. You can see there are sure a lot of sharp corners in a conventional toolpath. No wonder HSM can be so much faster! The question is, just how much faster can HSM be? In fact, what sorts of feeds and speeds should I be running with HSM? For a long time there was not much help available for feeds and speeds. CAM providers published various accounts of how fast customers were cutting, but relating such anecdotes back to your own machining is problematic. If nothing else, you have no idea whether those numbers are baseline, or hand tuned numbers developed for manufacturing a particular part with a lot of trial and error. If they are the latter, they will likely fail if you plug them into a different part on a different machine with a slightly different HSM toolpath algorithm, and so on. HSM is not something you can easily figure out with a few tables either. Fortunately, there are mathematical methods that work for it. After all, HSM is just physics and where there is physics some degree of predictability follows. The trick is to analyze the tool engagement angle being used for a particular cut (which can be derived by an HSM calculator from the cut width) and using that information together with a knowledge of how to calculate conventional speeds and feeds to “back out” the conservatism applied to conventional feeds and speeds due to corners. The two main effects that have to be accounted for are the chip clearance and the heating of the tool. Low TEA’s give the tool a greater proportion of the rotational circle in which to cool down in air or via exposure to coolant. The example cut being shown is a 1/2″ endmill in mild steel, 10% radial engagement as we’ve been talking about, and a full 1″ depth of cut. With an HSM toolpath that guarantees no corners will be cut, we can run 3936 rpm at 44.9 ipm feedrate. That’s a 1.6 HP cut. Without HSM, the cut falls back to 1765 rpm at 8.8 ipm for a cut that’s only 0.3 HP. The material removal rates for HSM are about 5x greater with HSM. You don’t have to think to hard to realize why these HSM toolpaths have become almost indispensible for a lot of shops. You can also use G-Wizard to get Feeds and Speeds those Trochoidal Milling Slots and we’ve written a Blog Post to tell you exactly how. I recently got a note from a G-Wizard customer who was interested in understanding some tool wear issues he was seeing. He had two toolpaths, one an HSM (High Speed Machining) toolpath and one a conventional toolpath. He was cutting hot rolled steel with a 1/2″ stub length carbide endmill, and making lots of small pockets just over 1/2″ deep. The scale on hot rolled can be tough on cutters, so he made a pass to remove that first. His question was all about tool life after that pass which was made with a different cutter. It’s all about the stepover or radial engagement. On the high speed version, you’re running 65% stepover. On the non-HSM version, you’re running 0.045 / 0.500 = 9% stepover. So two things to consider. First, the only difference between an HSM and a non-HSM toolpath is the HSM plays tricks to avoid radically increasing the engagement of the cutter in corners. For square corners, and 50% stepover, you go from 90 degree engagement to 180 degree in the corner, so the cutter works 2x as hard in the corner. So, the HSM path doesn’t have to work as hard in corners as your ramping path, but there’s no other special advantage it has as a result of the HSM paath. 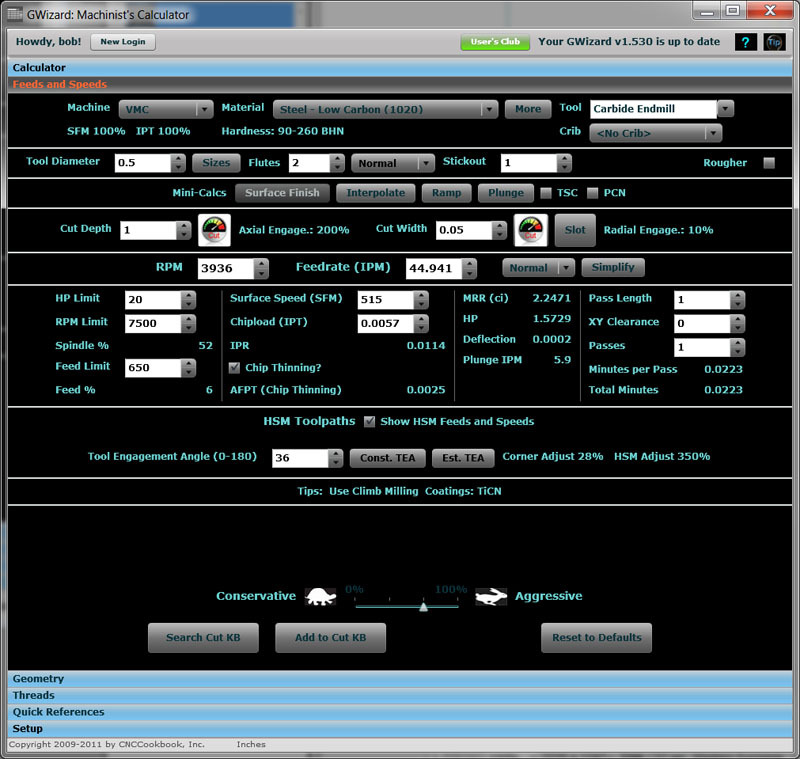 With G-Wizard, we can convert stepovers to tool engagement angles. So, the 65% stepover, if we key all that in, turns out to be 107 degrees. It’s a little better than the 180 degree case, but not hugely. If the 9% stepover were done with an HSM toolpath, it would be a 34 degree engagement–which is really starting to cook with fire. The reason this engagement angle matters so much is due to two factors: chip clearance and the ability of the tool to cool. It’s pretty easy to see, once we start thinking of these angles, why they matter. If the tool’s flutes are shrouded only 34 degrees out of 360 of a full rotation, they’re pretty wide open. It’s easy to get the chips out of the way and the flutes have a lot of time in air and coolant to chill down during the revolution. With 107 degrees, there is a lot less time. We go from only cutting about 9% of a rotation to 30%. The cutter is working at least 3x harder. So let’s put all this together. If we were only cutting in a straight line, every toolpath would be an HSM path–no corners to worry about. 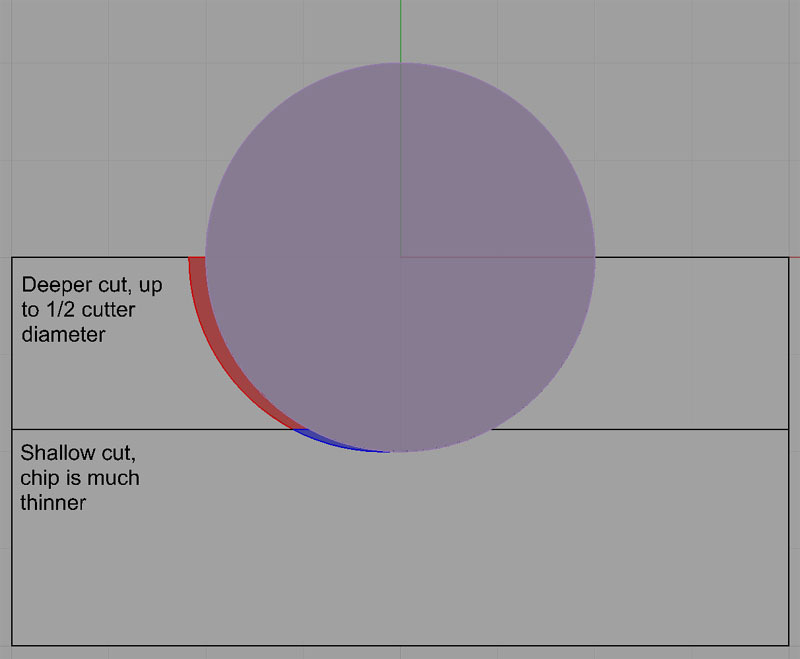 And, of the two cuts you used, the 0.045″ stepover cut is 3x easier on the cutter. All other things being equal, it can go 3x as fast in feedrate or it can have 3x the tool life at same speed, etc.. Those are over simplifications, but you get the idea. In this case, the stepover on the HSM path, was so close to a non-HSM in a square cornered pocket (e.g. 107 degrees engagement vs 180 degrees) that you didn’t get a lot of benefit from the HSM path for tool life. FWIW, a good starting stepover to try for HSM to maximize tool life is 15%. Measuring tool life by time misses productivity. We should measure tool life by cubic inches of material removed. Right? We’re using the tool to remove material. If it removes a lot more material over the life of the tool than some other scenario, but the tool doesn’t last as long in minutes, so much the better. That means the tool removes more material and does it a lot faster too. What could be better? I alluded to this earlier, but for production, you want to optimize the material removal rates on an HSM toolpath. G-Wizard’s CADCAM Wizard feature does this extremely well.